Struggling with UCAT preparation? In this post, we explain what decision making is and how to solve UCAT decision making questions. What is Decision Making in UCAT? The Decision Making section is second of the five UCAT subtests. It is used to assess your ability to apply logic to arrive at a conclusion or decision, analyse data-based information, and evaluate arguments. Why is Decision Making tested? Doctors, dentists, and/or medical professionals are often required to make quick decisions in complex situations. These important decisions demand excellent problem-solving skills and the ability to asses situations, manage risks and work without certainty. Medical practitioners are often required to apply their logical and reasoning skills to analyse statistical data or information presented in visual formats. These type of data-based questions don’t require advanced statistical knowledge. However, they are created based on everyday, practical reasoning. What is the format of the Decision Making subtest? The Decision Making subtest consists of 29 questions and is one of five subtests within the UCAT. Questions may ask you to refer to text, tables, charts, diagrams or graphs and must be completed in 31 minutes. All questions are independent and do not rely on other questions. Questions will include a presentation of information and will require you to decipher information and come to the most probable conclusion or answer. What are the types of Decision Making questions? The flowchart below illustrates the different categories in the Decision Making subtest. These types of questions require you to use provided information to take steps of deductive inference to reach a conclusion. Provided information will be in the form of text, tables or graphics. Jane, Carl, Smith, Kate and Dean all have either a Corolla or a BMW. The cars are either silver, blue, red or white in colour. Three of them are BMWs. Corollas are either blue or red. Jane and Kate do not have BMWs. Dean has a white BMW. BMWs are either white or silver. Jane and Kate do not have BMWs and therefore their cars must be Corollas which are either blue or red. Option B is therefore not true. Option C also doesn’t hold true as we do not know whether Jane’s Corolla is blue or red. We are told that there are three BMWs and therefore Dean, Smith and Carl must all have BMWs, which are either white or silver. Option A is not correct as although Carl must have a BMW, we cannot tell whether it is silver or black. Option D is true as Smith must have a BMW, and hence his car must be be silver or white. A syllogism is a type of logical argument that requires you to use deductive reasoning to use two or more propositions that are assumed, or asserted, to be true as a means to come to a conclusion. In these question types, you’ll need to assess whether the series of conclusions arise from the provided information. Some questions may have multiple correct response options and you’ll need to drag and drop your response. Sydney General Practice has found that its cold medicine prescription rates are 15% higher than the average prescription rate for the rest of the practices in the state. A review is undertaken and it is found that Dr Smith, who works at the Sydney practice, has been prescribing cold medicine at a higher frequency than the rest of the GPs in the practice. Which of the following conclusions can be drawn from the information provided in the passage? (A) Dr Smith’s prescribing habits are a contributory cause for the higher cold medicine prescription rates for Sydney General Practice. (B) Dr Smith’s prescribing habits are the main cause for the higher cold medicine prescription rates for the Sydney General Practice. (C) Sydney General Practice has the highest amount of cold medicine prescriptions compared to the other general practices in NSW. (D) Sydney General Practice should aim to reduce the number of cold medicine prescriptions prescribed. Option A is correct. It logically follows as she is prescribing more cold medicine prescriptions than anyone else, so would be contributing to the higher cold medicine prescriptions rates for the practice that she works at. Option B does not follow because we do not know if her colleagues are also prescribing at a higher level than expected. It may be that she is prescribing at a marginally higher level than the rest of her colleagues at the practice, who themselves are prescribing at a very high rate. Option C does not follow as the premise clearly states that Sydney General Practice has a 15% higher than average prescription rate. There could be other practices that have higher rates than Sydney General Practice that we don’t know about. Option D does not follow as we are not given information about the acceptable rate of cold medicine prescriptions is or whether 15% higher is unacceptable and should be reduced. In these question types, information is presented in different formats including text passages, charts, or graphs. Information must be interpreted to determine valid conclusions. Some questions may have multiple correct response options and you’ll need to drag and drop your response. Passes for seats at a K-pop concert are on sale. There is a choice of seats which are either VIP by the stage or general seating. General seating seats are closed when it rains. The weather agency has predicted that it will not rain on 15 out of 18 concert days. The likelihood that the seats are closed for maintenance is four sixteenths for the VIP seats and one quarter for the general seating. Considering only the likelihood of rain and the chance of the seats being closed for maintenance, is it better to buy passes for the general seating? (A) Yes, the chance of the seats being unavailable due to maintenance is lower compared to the VIP seats. (B) Yes, there is a 1 in 6 chance that it will rain and therefore the probability that it will rain is low. (C) No, the likelihood of the general seating being unavailable due to maintenance is 50% higher. (D) No, as the VIP seats will never be closed due to rain. The chance of being closed for maintenance is 4/16 for the VIP seats which is simplified to 1/4, so is the same as for general seating. Hence, options A and C are incorrect. The likelihood of rain is 3 out of 18 days which is the same as a 1 in 6 chance of rain as noted in option B. However, the VIP seats are never closed to due rain, so it is better to buy passes for the VIP seats. These types of questions require candidates to evaluate for and against arguments to find a solution to a particular problem. You’ll need to assess the strength of arguments and validity of assumptions. There is only one correct response in these type of questions and candidates must dismiss their own beliefs in order to arrive at the strongest conclusion. A pharmaceutical company tested a weight loss drug on a group of 180 volunteers. The test subjects reported to the lab between 9 am and 5 pm each day in order to receive their dose of the drug. After a six week trial, the test subjects were found to have lost 4 kg on average. The company declared the weight loss drug a success. What assumption was made by the company? (A) That the drug worked best if taken before dinner. (B) That the test subjects were happy with losing 4 kg on average. (C) That the test subjects had not changed their lifestyle during the test. (D) That the test subjects were trying to lose weight. In order to conclude that the drug was responsible for the weight loss, the subjects had to not change their lifestyle in any way (e.g. diet, exercise, stress levels). If there were changes to the test subjects’ lifestyle those changes may have been responsible for the weight loss rather than the drug. Option A is may be true but the time window given corresponds to business hours, so it cannot be concluded that it is related to when the drug is best administered. There is no information about option B – whether the subjects were happy, and it is not a necessary condition for the drug to be effective. Similarly, option D is not a necessary assumption as if the drug is successful it would work whether or not the test subject wanted it to. In these types of questions, you’ll be presented with a Venn diagram which you’ll use to select the best conclusion using a series of statements. Some questions will consist of a text passage with information that you can organise into a Venn diagram or by providing conclusions. Alternatively, you may be provided with a series of statements and a series of Venn diagrams as the different responses – you’ll need to select the Venn diagram that best conveys the provided information. 48 students are asked what they most commonly eat for breakfast. 21 students eat cereal. 18 students eat fruit, of which 6 also eat toast. 23 students eat toast, of which 8 also eat cereal. No student eats all 3 types of breakfast. 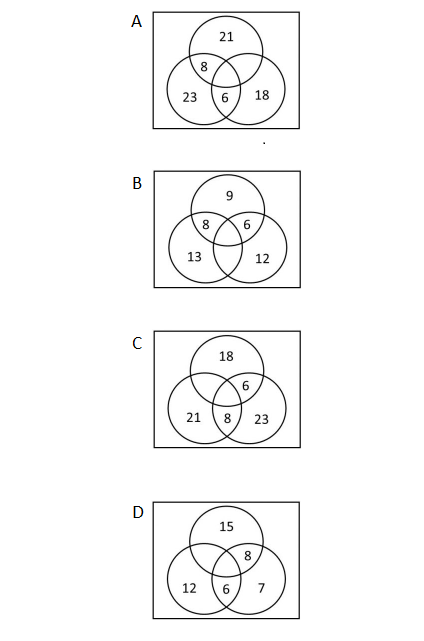 Which of the following diagrams represents this? We know that 6 students eat toast and fruit for breakfast and that 8 students eat toast and cereal for breakfast. Therefore, we can identify the circle that represents those who eat toast in each option as there will be students in both areas that overlap with other circles. We know that there are 23 students in total who eat toast, so by adding all the numbers in the circles that represent this group, we can see that option B fulfils the criteria. These type of questions will consist of a short passage of text with statistical information. You’ll need to select the best answer to the question. A coin has a 50% chance of landing on heads and a 50% chance of landing on tails. The coin is flipped five times to give H, T, H, T, H.
The sixth coin toss will definitely give tails. (A) Yes, as the pattern alternates between heads and tails. (B) Yes, since the coin is balanced it must produce an equal number of heads and tails. (C) No, because there is a chance it will give heads. (D) No, because the chance of giving tails is not greater than 50%. The outcome of a coin flip does not depend on previous coin flips, so there is a 50% chance the sixth coin flip will give heads. This also means option A is incorrect as the pattern is only coincidental, and B is incorrect as there will be an equal number of heads and tails on average, not in every instance. Option D is incorrect, as for the coin flip to definitely give tails the probability of tails would need to be equal to 100%, not just be greater than 50%. Don’t leave UCAT to chance!